Joanna Lennox is a fine bred English lady. She's pretty, intelligent, witty and...on the shelf. With an influential baron as her brother and a hefty dowry, she should have gentleman lining up at her door but instead she seems doomed to become a spinster. 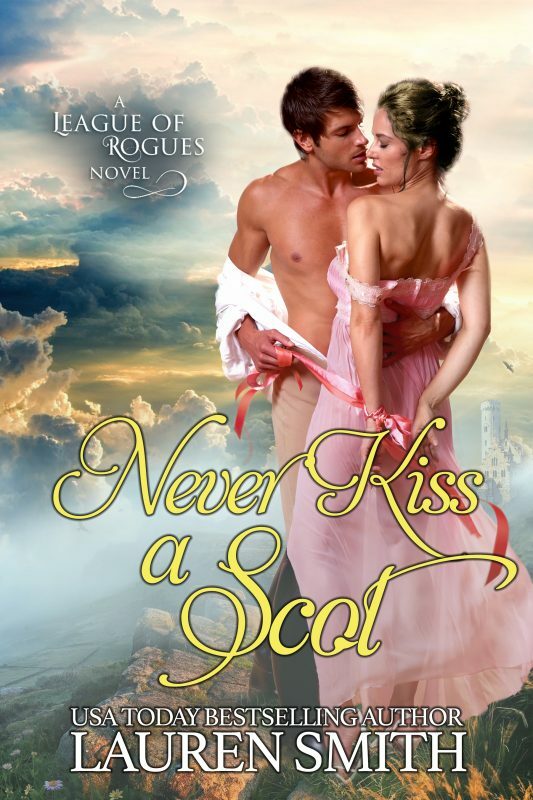 Then one night a handsome highland lord steals a kiss from her in a library which stirs her deepest desires. Desperate for a life and a love of her own, she turns to the darkly handsome, brooding, Scottish lord who lights a fire within her with his touch. But will his secrets and enemies tear them apart? Brock Kincade knows better than to go around kissing English ladies in dark libraries. Especially when a lady is the little sister of the man who will shortly be his brother-in-law. But Joanna is pure temptation, and he's been denied that innocent affection for far too long. He doesn’t believe in love, but he believes in lust, and after that single kiss, he knows he wants her as his wife. He might not love her, but he'll care for her and fuel the passionate fire between them with pleasure. There’s just one problem: He’ll have to steal her away from her overprotective brother and his devilish band of friends, the League of Rogues.